Online Fudge Sales: Exclusive Drummond Island ” Puddingstone Fudge”, Chocolate Fudge, Chocolate Walnut Fudge, Coconut Cream Fudge, Chewy Praline Fudge, Butter Pecan Fudge, and many more! Online fudge sales from our Island to your home, business, or organization. 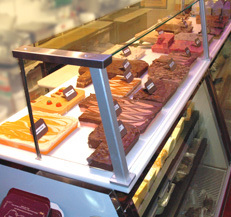 Our homemade fudge varieties are made by our experienced fudge artisans here in our unique shop on Drummond Island. We are located in Michigan's beautiful Upper Peninsula surrounded by majestic and peaceful Lake Huron. Homemade fudge made by real "fudge artisans" using real cream, butter and superior ingredients! Make us your Island Fudge Headquarters! "People in Michigan know fudge. And the very best fudge we've tasted is from the Drummond Island Fudge and Confectionary." We carry all of your favorites! Fudge was invented in the United States over 100 years ago. Back in the old days, fudge was only created in a couple of flavors! Now, this delicious treat is made available to you through our website in a variety of flavors! Visit Fudge History to learn more. Amaretto, Blueberry Cheesecake(seasonal), Butter Finger, Chocolate Caramel Nut, Chocolate Mint, Chocolate Raspberry, Peanut Butter Chocolate, Heath Bar, Maple, Chocolate Walnut, Orange Cream “Creamsicle”, Pumpkin Pie (seasonal), and many other varieties and flavors! Order online Fudge for just $8.99 per half pound. All other confectionaries / products are priced individually. Please add 10.95 shipping for orders under $100. Shown to the right is our in house fudge gallery where you can come see us in person on your next vacation to Drummond Island!! We invite you to visit us in person! Our location is a superb vacation dreamland. Please explore our entire website for all of our products and services. Our Gourmet Galley International Marketplace and Delicatessen features our famous 1/2lb. New York Style Delicatessen Sandwiches, fresh baked bread, and more! We also have a great Coffee Shop! Espresso Bean Cafe - starring "Seattle's Best Coffee". Visit our 1950's Style Ice Cream Shop and try some delicious Ashby's Sterling Ice Cream, Malts, Shakes, and Sundaes. Enjoy dining at the Port of Call Restaurant & Lounge serving Seafood-Steaks and Specialty foods including locally caught fresh perch, walleye, and whitefish, our famous hickory and applewood smoked baby back ribs, chicken, imported beers, wines, and more! Sportsmen will love the one stop shopping in L&M Bait and Tackle Shop! Also come and explore our Island Flower Gift and Garden Center - great clothing, fresh flowers, & bedding plants. Planning a Drummond Island Wedding? Come see us for your fresh flower arrangements! 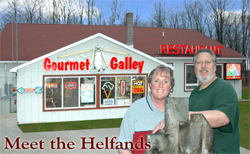 The Helfands have been proudly serving Drummond Island for 20 years! "We are truly excited to provide our premiere products to patrons nationwide through our new website. 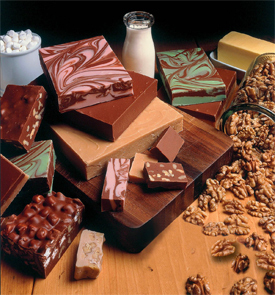 We invite you to visit our Fudge History page to learn more about us, our facility, all our services and products and finally our fantastic homemade fudge!"